Welcome to HADO-UK: The first Augmented Reality (AR) & Sports Venue in the UK, Located in Birmingham City Centre. The start of the road to Tokyo and the 2019 HADO World Cup. This is the first of 4 qualifier matches that will be held throughout 2019. Entering the qualifiers is how you get a team place in the UK Championship and the chance to go to Tokyo as the UK team. Team Training: Every Wednesday, Thursday & FridayEvening 7-9pm. Come as a team or as an individual and train to be the best! Beginner's Session: Every Saturday Evening 7-9pm. Monster Battle: Defeat the Legendary Red Dragon for a £500 cash bounty! Astonishing AR and Dynamic Movement! Player can see the AR animation within the real world and move alongside their AR creations! Motion sensor and intuitive game play! 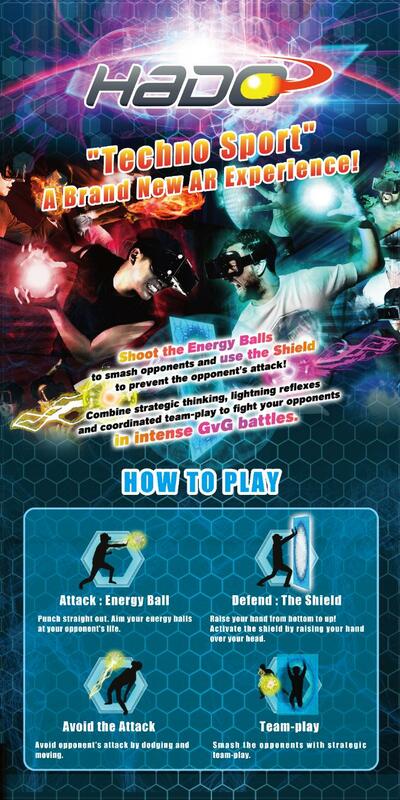 Motion Sensors detect arm movement, making the game intuitive and easy to play. Interaction with AR objects becomes second nature very quickly! Spectators can see everything in the game! We show all the AR animation through monitors so that spectators can enjoy the show in full! Televised matches show player status and team scores. compete against the very best! Battle it out in qualifiers for the right to compete in the HADO World Cup in Japan where there is a £30,000 prize pool up for grabs!